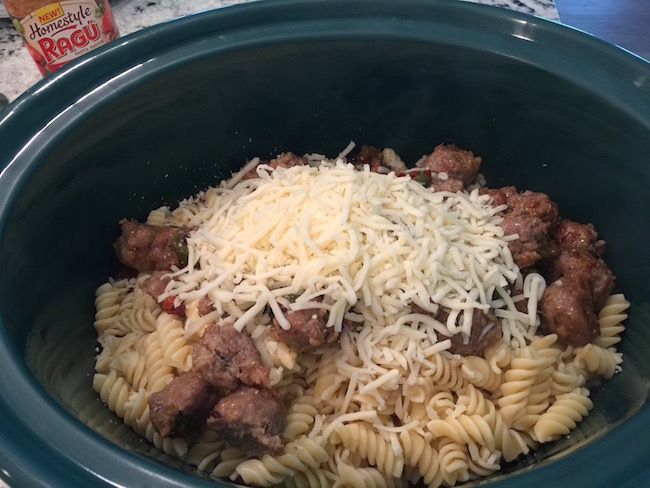 Italian Sausage Pasta Casserole Recipe! 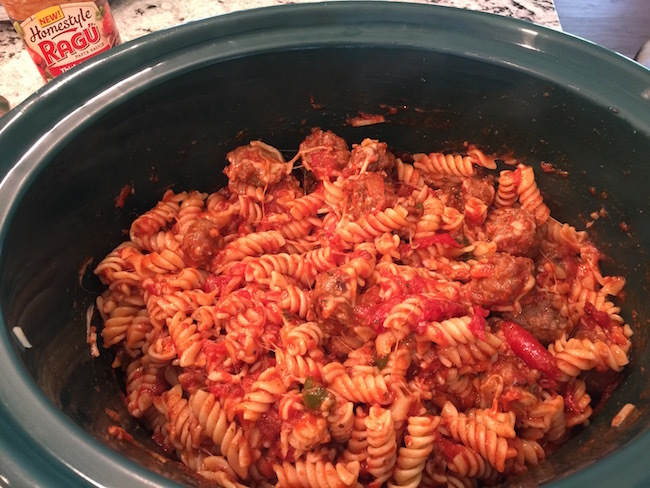 My Italian Sausage Pasta Casserole recipe is one that I have been making for the past 35 years. It’s one meal that my family loves and disappears quickly leaving no leftovers behind. But now, it’s gotten even better and easier to make with new RAGÚ® Homestyle Sauce. 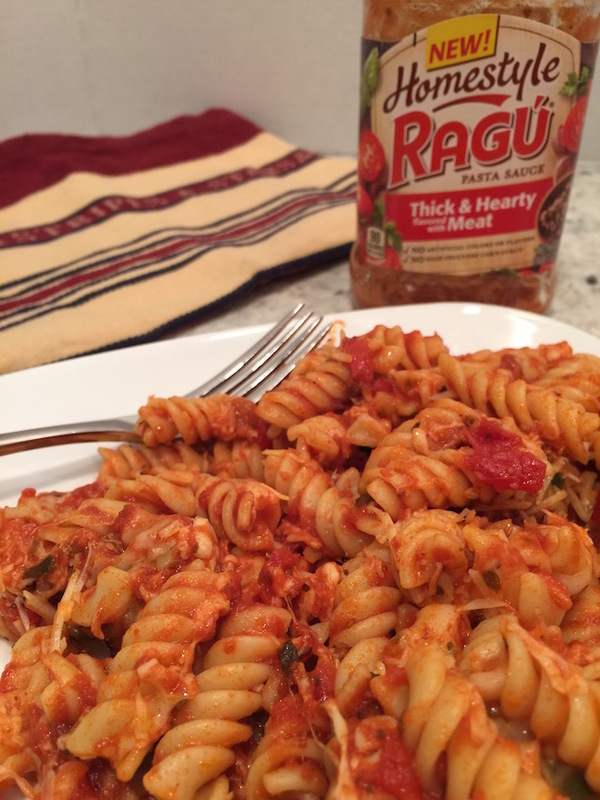 RAGÚ® Homestyle Sauces is their thickest sauce and you can tell because it hugs the pasta! Made with NO artificial flavors, artificial colors or high fructose corn syrup. They peel, chop and simmer the ingredients and use a special blend of herbs (basil, fennel, oregano and black pepper) to layer and build the flavor so it tastes just like my own sauce. Don’t forget to head down to the $25 Paypal Cash Giveaway. 5 Italian Sausage Links (casings removed). 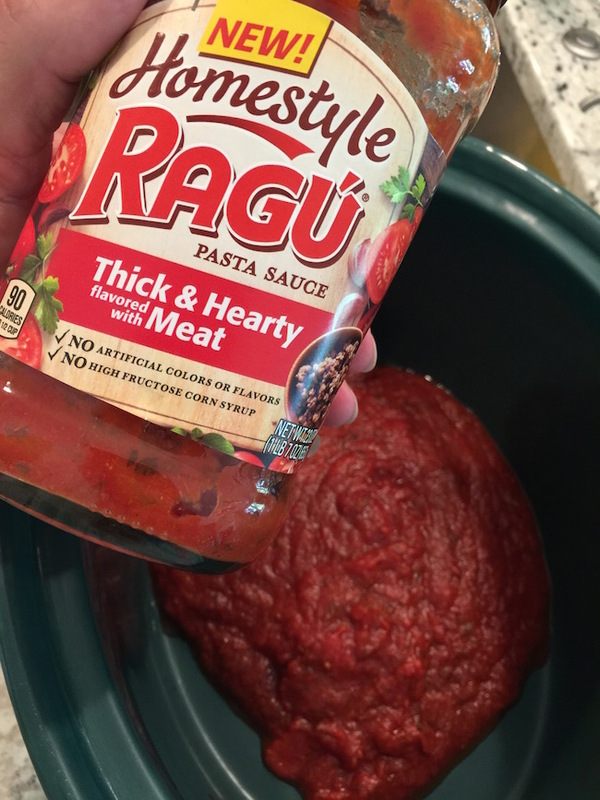 1 jar of RAGÚ® Homestyle Sauce – I used RAGÚ® Thick & Hearty Meat Sauce. 2 Cups shredded mozzarella cheese. 1 cup of sliced onions and peppers. (I use a frozen mix). 1 lb. of Rotini pasta noodles. 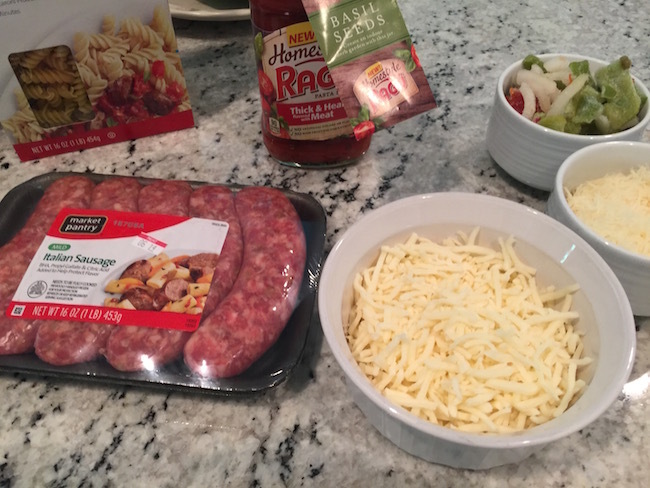 Remove casings from Italian Sausage and cut into chunks. Fry until thoroughly done and no pink remains. 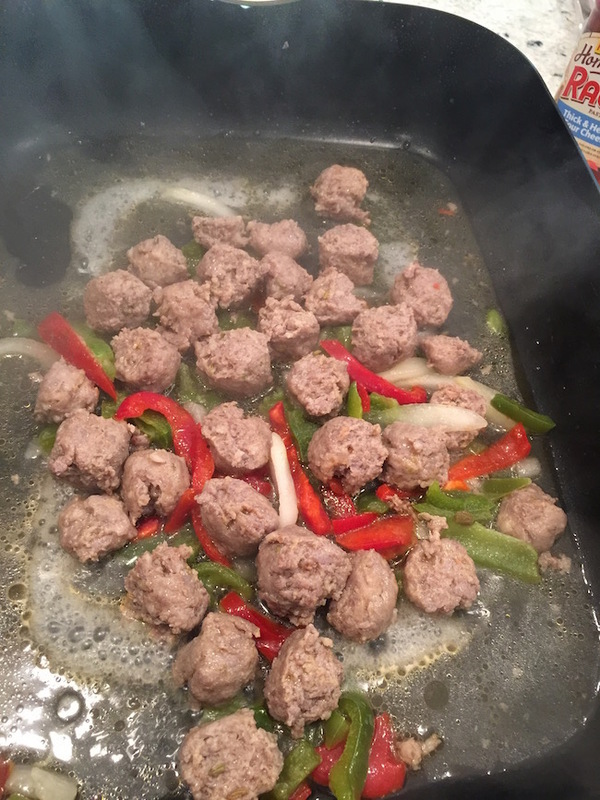 Add onions and peppers and fry with Italian sausage until soft. 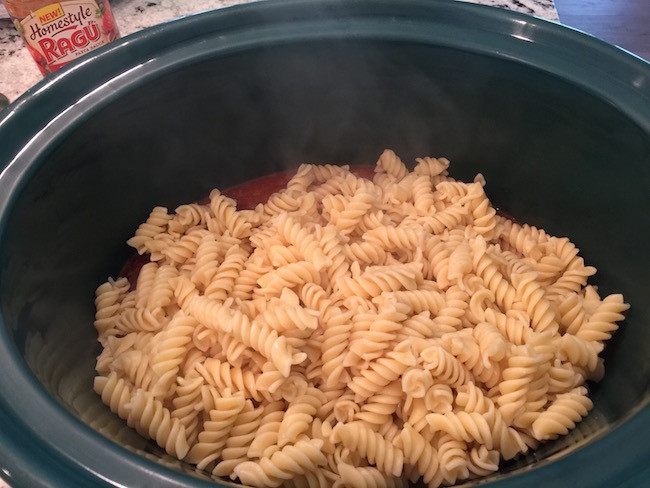 Layer in slow cooker. 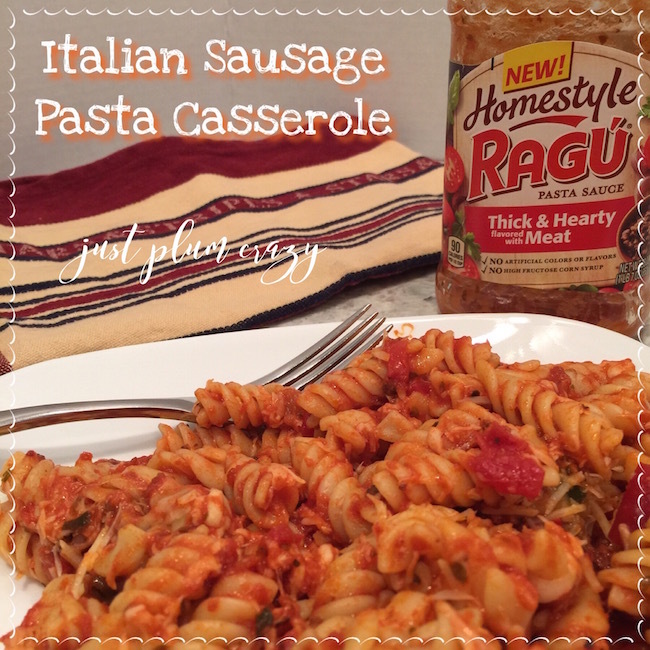 Pasta, Italian Sausage, RAGÚ® Homestyle Sauce (you can use whichever flavor you prefer. ), Mozzarella Cheese. Homestyle Thick and Hearty Traditional Sauce. Homestyle Thick and Hearty Meat Sauce. Homestyle Thick and Hearty Four Cheese Sauce. Homestyle Thick and Hearty Roasted Garlic Sauce. Homestyle Thick and Hearty Mushroom Sauce. Growing up, my mom made dinner daily. It was a rare treat that we went out to eat. Home cooked meals everyday are a thing of the past these days but it doesn’t mean that you have to forfeit homestyle meals all the time. Homestyle to me means home cooked meals made with love. It doesn’t have to be a 7 course meal or something that you slaved over the stove for all day either. It’s something that you made that tastes good. 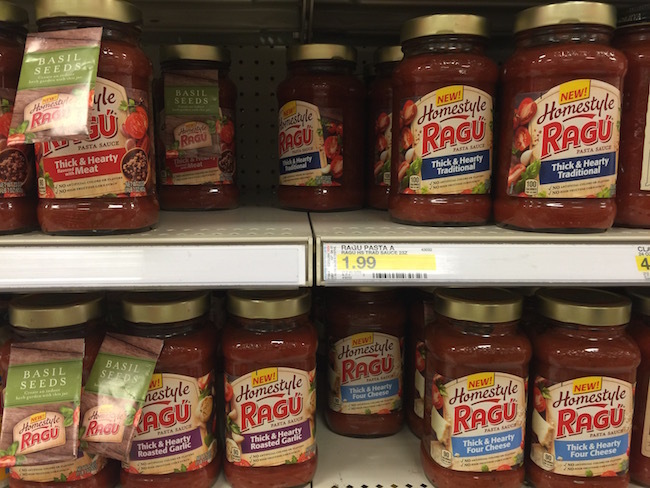 RAGÚ® Homestyle Sauces are thick and have that home cooked taste. It has a made-from-scratch taste that hugs every last noodle. Be sure to check out all their recipes. What does Homestyle mean to you? 5 Italian Sausage Links casings removed. 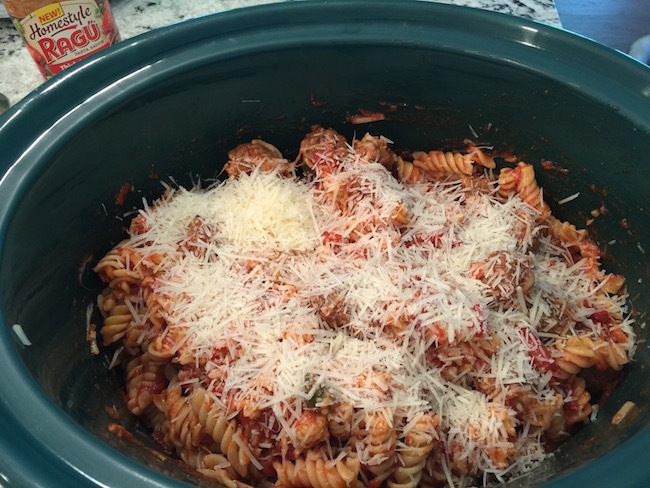 1 jar of RAGÚ® Homestyle Sauce - I used RAGÚ® Thick & Hearty Meat Sauce. 1 cup of sliced onions and peppers. I use a frozen mix. We like the Spaghetti Puttanesca recipe ! I like their rustic italian bowls. The Grilled Chicken Parmesan looks so yummy! I’d like to make the SPAGHETTI PUTTANESCA! I would love to try the Grilled Chicken Parmesan recipe. Can’t go wrong with the homemade pizza recipe. My favorite recipe is the spaghetti with stuffed meatballs. I would love to make the rustic Italian bowls. They sound so good. I like the Spaghetti Puttanesca recipe. I would like to try the SKILLET CHICKEN PARMESAN recipe. Thank you!! ITALIAN MEATLOAF recipe is one of my favs. Chili mac n cheese would be good. the stuffed shells with hearty greens recipe sounds really good. The SPICY VEGGIE QUESADILLAS looks good to me. Creamy Tomato Bolognese with Rigatoni would be best, I think. The PENNE PRIMAVERA looks delicious! 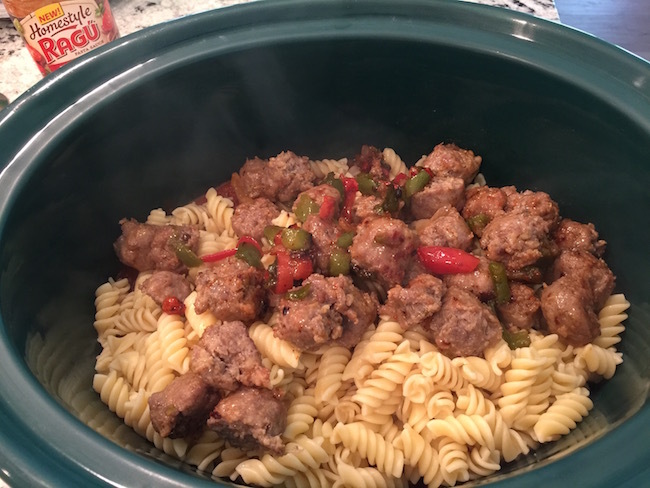 I love the Tuscan Style Sausage Sandwiches recipe. A have to make soon! Creamy Tomato Bolognese with Rigatoni would be best. I would like to make the Spaghetti Puttanesca. My favorite is the RUSTIC ITALIAN BOWLS! My family would love it! My favorite recipe from the Ragu site is the CHICKEN & BROCCOLI ALFREDO WITH FETTUCCINE. I would like to try the PENNE PRIMAVERA recipe. Rustic Italian Bowls look good. Also simple to make. I would love to try the Shrimp Fra Diavolo is sounds great. I suspect the Chili Mac and Cheese could become a favorite of the family. I’d like to try making the Grilled Chicken Parmesan. The chicken parmesan looks so good…if I had to pick one! I would love the chili Mac and cheese! Perfect week night meal! The SPICY BRAISED CHICKEN AND PENNE recipe looks good to me. I would enjoy the PENNE PRIMAVERA recipe. I like the homemade pizza recipe. My favorite would have to be the Homemade Pizza! I’d like to make the Chili Mac & Cheese. I want to make the Grilled Chicken Parmesan. my favorite recipe is the TUSCAN-STYLE SAUSAGE SANDWICHES! those are amazing! My favorite recipe is Spaghetti and Turkey Meatballs. Oh I think my favorite is their GRILLED PIZZAS! I have to try those on our grill! What a great easy idea! My fave recipe is Grilled Chicken Parmesan. The four cheese sauce sounds super yummy! I’ll have to try it out! I would love to try the meatball parmesan. The RUSTIC ITALIAN BOWLS recipe found on the Ragu site look quick and yummy. My favorite recipe is the Chicken & Broccoli Alfredo with Fettuccine. SHRIMP FRA DIAVOLO sounds awesome. I like Quick Summer Gazpacho. I would like to try the Skillet Lasagna recipe. I want to try the SHRIMP FRA DIAVOLO!! YUM! I think the Penne Primavera looks delicious! My favorite reciepe is the GRILLED CHICKEN PARMESAN . So quick and easy. I would like to try the recipe spicy veggie quesadillas. The spicy veggie quesadillas definitely look delicious, thank you so much for this offer! I think the meatball parmesan looks good. I think the Skillet Lasagna looks tasty. The Caprese Farfalle looks awesome! 1. Combine ground beef, bread crumbs and egg in medium bowl; shape into 12 meatballs. Press 1 cheese cube into each meatball, enclosing completely. 2. Bring sauce to a boil in large saucepan over medium-high heat. Gently stir in uncooked meatballs. 3. Reduce heat to low and simmer covered, stirring occasionally, 20 minutes or until meatballs are done. Serve over hot spaghetti. http://www.ragu.com/our-sauces/homestyle-sauces/thick-hearty-traditional-sauce/ is my fav 😉 <3 yum!!!!!!!!!!!!!!!! The Spicy Veggie Quesadillas look delicious! The skillet lasagna sounds delicious! My favorite is FARMER’S MARKET STACK. It has so many good items in it. 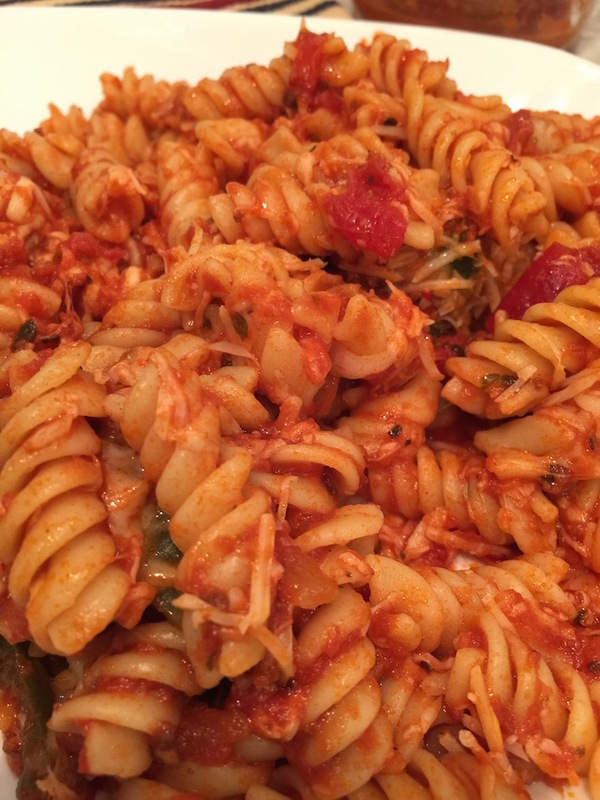 My favorite recipe is the SUN-DRIED TOMATO & TONNO ORECCHIETTE. It looks SO good! The Grilled Chicken Parmesan looks like a yummy and healthy recipe. Gotta try it! I would love to try the Beef Alfredo Chili Mac! My sons love Alfredo also! I’d like to try the Shrimp Fra Diavolo recipe. is the BRAISED TUSCAN SHORT RIBS. Quick Summer Gazpacho looks yummy! I am a soup person. I know my whole family would love the CHICKEN & BROCCOLI ALFREDO WITH FETTUCCINE! This would be a really hearty dish to make on a cool day. My favorite recipe is the Spicy Veggie Quesadillas. The Rustic Italian Bowls sounds great! The Caprese Farfalle looks delicious. The chili mac and cheese looks really good and easy! The SPICY BEEF & CHORIZO GRILLED PIZZA sounds yummy! My favorite recipe from the Ragu website is the Poblano Chicken Alfredo. I would love to try the GRILLED CHICKEN PARMESAN. My favorite recipe is the Homemade Pizza! Looks so delicious! My favorite recipe is the BRAISED TUSCAN SHORT RIBS. I also like the spicy veggie quesadillas recipe. I want to try this one! I would like to try the SPICY VEGGIE QUESADILLAS, they look good! Everyone in my family would enjoy the SHRIMP FRA DIAVOLO. The rustic italian bowls recipe sounds delicious! My favorite is the Grilled Chicken Parmesan. Thanks so much. The NOODLE-LESS ZUCCHINI LASAGNA would be perfect for when I cook for my gluten free mom. I love Chicken & Broccoli Alfredo with Fettuccine recipe. I like the Caprese Farfalle dish! My favorite is the Spicy Veggie Quesadillas recipe.